An army of Black community organisations have come together to organise a programme of events to recognise the anniversary of the Black People’s Day of Action 30 years ago. The date Wednesday, 2nd March remembers the New Cross Fire demonstration that was the beginning of mass black demonstrations in this country. 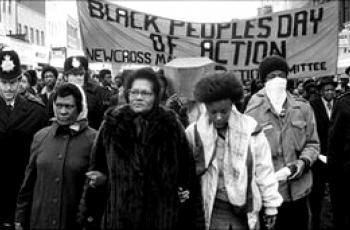 Thousands mobilised on ‘The Black People’s Day of Action’ - March 2 1981 to draw attention to the failure of the Metropolitan Police to fully investigate the circumstances surrounding the New Cross house fire - A tragedy in which thirteen young people lost their lives and which today over 30 years on, the case still remains unsolved. The London Black People's Day demonstration in 1981 began a year of uprisings that set the streets of Britain ablaze - when Black communities across the country - London, Birmingham, Leeds and Liverpool - rose up in revolt against prejudice and oppression. The first is a group of community organisations - Nu Beyond, BlackHistorywalks, Positive Mental Attitude Community College and Lewisham Black Staff Forum, who have put together - The Black People's Day Of Action: Remembered 30 years – which is part of a series of films, lectures, talks, walks and events to celebrate the outstanding talents of Black individuals “stalwarts in our communities” alongside an ongoing programme of community empowerment and education. A ‘Black History Walks Walking Tour’ will reveal the African influence in Britain around London streets within the institutions and its architecture. Speaking about the up-coming walk, Tony Warner of BlackHistoryWalks says; “Our most popular walk is in the 'Square Mile' or the City of London. This is the oldest part of London and has a distinct political identity as it has its own Lord Mayor. It is also the centre of wealth creation for Britain but much of that wealth has been, and still is, created by Africa. “The unique St Paul’s/Bank walk takes inside streets and back alleys that you would never see from the main road. Along the quiet footpaths we uncover the hidden connections between Africa, the Diaspora and the infrastructure of ancient and modern London. “We show how certain fraternal societies benefited from African wealth and invested that wealth in academic institutions and charities. We reveal how African names came to be given to streets and areas. “Though the visual imagery of London we point out and obvious African influences, which are so often ignored despite being quite blatant. There is even African architecture on display in certain areas although it is not recognised as such due to the euro-centric bias of the education system. "The walk illustrates the presence of Africans from Roman times and the British reaction to immigration as far back as 1596 when the Queen stated there were too many black people in Britain and they should be sent home! We see banks and buildings, which were built directly and indirectly with African labour; we discuss the black British soldiers of 1776 and 1794 and make comparisons to the black Spitfire and Bomber pilots of World War 2”. The Day of Action event is on March 2. Black History Walks - from January to November. The second event, called the National Black People's Day of Action (NBPDA) – is organised by a coalition of community groups who will mark the day with with a march from Pagnell Street, New Cross to Lewisham Police Station, followed by a rally. The National Black People’s Day of Action, say they their aim is to promote nationwide awareness of the historical events and to commemorate the day. The group says they aim to “put together a long-term agenda for community empowerment and capacity development. And to work towards tackling social maladies such as drugs, guns and gang violence, school exclusions, underachievement, deaths in custody, and other ills which continue to destroy lives; especially youths”; under the slogan; "Let's look beyond the limitations and see the possibilities." The 1981 ‘day of action’ is cited as ‘the most powerful single event and an historical landmark for the African presence in Britain; action that ushered in a turbulent decade that changed the political landscape in Britain’. The coalition wants to seize the opportunity to use future NBPAD activities to educate young people about the historical political struggles and engage them in a new era of self reliance and community activism.